Modifications: I added a chopped onion in with the garlic and mushrooms. I’m not sure I had quite the amount of mushrooms this calls for, we just had some leftover, so used what we had. When the onions/garlic/mushrooms were sautéing, I added some white wine in a few times to deglaze the pan before adding the cream and butter. I also only used half a pound of pasta because only Ben and I were eating this but we then had a lot of leftover sauce. I think it’ll taste better with fresh pasta anyway though. Notes: This was DELICIOUS. I’m pretty glad I finally came around to mushrooms. Chopped them up small because I still don’t love the texture. This was a very rich, decadent meal – needed the veggie on the side to cut the richness a bit. Roasted brussels sprouts were great, but I also think some garlicky kale would be good too. 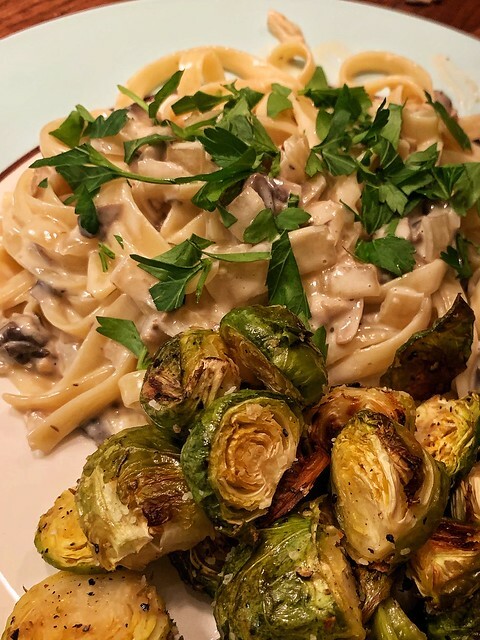 This entry was posted in cream, mushrooms, parmesan, pasta, vegetarian. Bookmark the permalink.